Maodo Lo has had a strong start to his professional career with EuroLeague team Brose Bamberg. Now he takes on Taking The Charge. 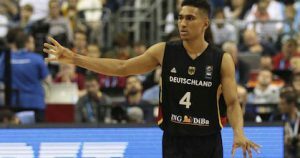 Episode 218: We focus on the interview this week with Maodo Lo, who played for Germany at the FIBA EuroBasket 2017 qualifiers and now plays for Brose Bamberg. We also look a bit at Crvena Zvezda’s Marko Guduric.